To outline the basic functions of the endocrine system, including what endocrine function is and feedback mechanisms within the body. Communication: The endocrine system, along with the nervous system, is one of the main communication pathways within the body. Control centre: The role of the control centre is to determine the set point (e.g. 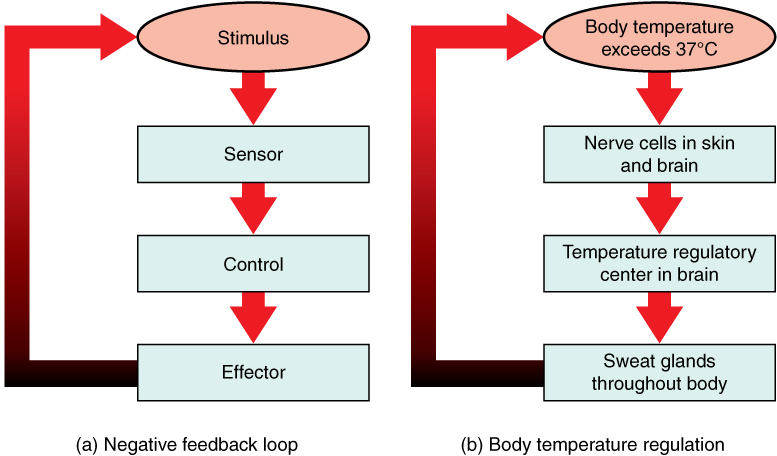 normal core body temperature), to analyse the afferent input (e.g. an increase in core body temperature), and to determine the appropriate response (e.g. co-ordinating a response to lower core body temperature). Two important control centres in the brain are the hypothalamus and the medulla oblongata. Receptors: In the body, sensors are required to detect stimuli (e.g.changes in the environment). Sensors are usually specialised nerve endings, such as chemoreceptors (detect changes in CO2, O2, and pH levels), thermoreceptors (detect changes in temperature), proprioreceptors (detect movement and changes in position), and nociceptors (detect dangerous stimuli). Sensors communicate input to the control centre via afferent nerves. In negative feedback, the output inhibits the function of the control centre, and the effector acts to oppose the stimulus, giving stability to control systems, and allowing the set point to be controlled within fine limits. In positive feedback, the stimulus produces a response which increases its effect, causing it to deviate further away from the set point. Diagram: Negative feedback shown diagramatically, with regulation of body temperature used as an example. A considerable amount of regulation is carried out by the regulatory centre of the hypothalamus in the brain (Source). The set point in a human can vary over time, which gives rise to biological rhythms. An example of this is cortisol, which has varying set points depending on the time of day (peaks at 7am and troughs at 7pm). Another example is the menstrual cycle, which is controlled by the set point of a number of hormones (e.g. oestrogen, progesterone, FSH, LH etc.) which changes throughout the monthly cycle. The suprachasmatic nucleus is a small group of neurones in the hypothalamus, and is said to be the body’s biological clock. The natural diurnal cycle is the time that our biological clock runs to (24hrs 11mins), which is helped by the use of environmental keys (e.g. changes in light levels to differentiate between day and night), and set by melatonin released from the pineal gland in the brain. Jet-lag is caused by the mismatch between the natural diurnal cycle and the environmental keys. Graph: The rise and fall of melatonin levels (maintained by the pineal gland) within the body based on the time of day - melatonin is the key chemical involved in the diurnal cycle (known as the biological clock). Melatonin is responsible for controlling levels of "wakefullness" and inducing a sleep state, with problems relating to melatonin production/control leading to common ailments such as insomnia (Source). Hormones are normally present in the blood at very low concentrations. They are secreted by endocrine glands into the bloodstream directly, and the cells that they act upon are known as target cells. It is usually a change in the concentration of the hormone that produces a response in a target cell. Hormones can be classified as peptide/polypeptide hormones (e.g. insulin), glycoprotein hormones (e.g. FSH and TSH), amines (adrenaline), and steroid hormones (e.g. cortisol). Polypeptide hormones, glycoprotein hormones, and adrenaline are all hydrophilic -they are transported in the bloodstream dissolved in plasma. Steroid and thyroid hormones are hydrophobic, and need specialised transport proteins (e.g. cortisol is transported bound to transcortin). Generally, the effect a hormone has on a target cell depends upon its concentration in the bloodstream. The endocrine glands that produce the polypeptide hormones and catecholamines normally store their hormonal products within the cell in discrete storage vesicles prior to secretion. The steroid producing tissues don’t store hormones, but store cholesterol as cholesterol esters in the form of lipid droplets. The thyroid gland is an exception to these types of endocrine tissue, as its hormonal products are stored outside the cell as colloid. The secretion of hormones is generally controlled by negative feedback, but in many cases the secretion of one hormone is controlled by another. In this arrangement, the second hormone is known as the tropic hormone (not to be confused with trophic hormone: a hormone that stimulates growth in the target tissue). Tropic hormones are mostly secreted by the anterior pituitary gland. Diagram: Example of tropic hormone release from the hypothalamus within the woman. GnRH is released from the hypothalamus, stimulating the posterior pituitary to release FSH and LH (these are known as tropic hormones), which act on target cells within the ovary to cause both follicular release and production of steroid hormones and oestrogen (Source). To change the activity of a target cell, hormones must chemically interact with it. The first stage is to bind to specific, high affinity receptors either on the cell surface, or within the cell. The location of the receptor in the target cell depends on the chemical nature of the hormone. Lipophilic hormones bind to receptors inside cells (cytoplasmic and/or nuclear receptors), and hydrophilic hormones bind to receptors on the cell surface. The binding triggers changes in the target cells, which may be in the activity of enzymes or other proteins (initiates a quick response from target tissues), or in the expression of genes (this happened over a longer period of time, and may even occur after the hormone concentration initiating the response has returned to normal). A second messenger is often released to influence the cell’s activities. Inactivation of hormones occurs in the liver and kidney, and sometimes in the target tissues themselves. Steroid hormones are inactivated by a small change in chemical structure that increases their water solubility, enabling them to be excreted from the body in urine or via the bile. Protein hormones undergo more extensive chemical changes and are degraded to amino acids that are reused for protein synthesis.